The face of a man who loves snow – NOT! With the recent winter storm that hit most of the U.S. this week, Missouri had several feet of snow. In fact, it’s never snowed this much the whole 21 years I’ve lived here. Ray and I haven’t ever had to shovel snow before. Until now. We found out quickly today that we needed a snow shovel. Our car was parked in the garage, trapped there by the avalanche of snow in the driveway, so we couldn’t drive to go get one. The regular shovel we had, while great for other things, was making real slowwww progress as we tried to shovel our driveway, so we borrowed our neighbor Leetha’s snow shovel. Leetha is 90 years old, petite, and adorable. She still drives a car, gardens in her yard in spring and summer, and feels pretty good for being almost a century old. “But I don’t walk like I used to,” she hilariously told me one day, smiling with her pretty, crinkled face. Leetha is such a sweetie and was happy to loan us her snow shovel. 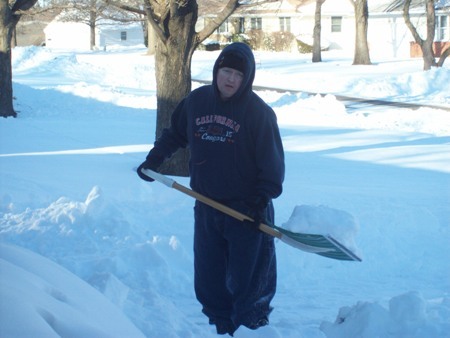 Today after attempting to shovel several feet of snow with our pathetic, ordinary shovel, Ray said to me, “You need the right tools for the right job.” Leetha’s snow shovel helped us to get our driveway, front porch, and front sidewalk done so much more quickly. 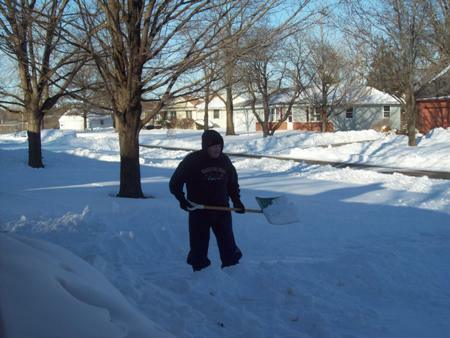 Ray and I took turns shoveling the driveway (he did most of it!). After the driveway was finished (which meant we could finally drive our car! ), we needed the front porch and front sidewalk done. For this job, I knew girly-girl shoes would NOT do. I needed some good gumboots. I LOVE gumboots. I love the name. GUM-boots (I like gum.) They’re also called gummies, rubber boots, top boots, wellies, and muckboots. The dance began as a form of communication in the late 19th century in the gold mines of South Africa. Miners were forbidden to talk while they worked, and stripped of the right to wear their tribal garments. So they started a system of communication using their work attire and native tribal rhythms, which included the gumboots. I promise I won’t start dancing in my gumboots – but maybe I will because dancing IS a power tool, as you will found out in just a minute! I love the way gumboots look. They’re great for everything from jumping around in mud puddles to kicking piles of snow to pretending you’re an Australian (you MUST have the right accent if you do this!). Not that I do ANY of these things, mind you. 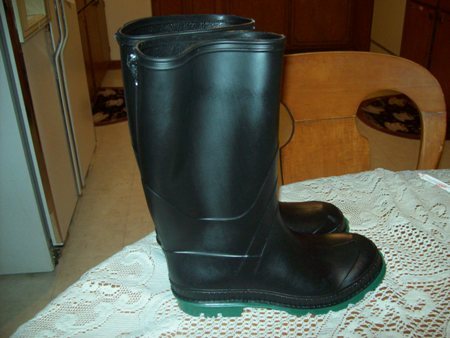 Sooo…today I went out and bought me some reasonably-priced gumboots. They are black with forest-green on the bottom. They are GREAT. Should I get on with the point of this post? All right! To be effective, tools must be used. I encourage you to use these tools each day, and you will experience victory in Christ! © Copyright 2011 Beth Jones. http://www.bethjones.net. All Rights Reserved. ← The webinar on women and spiritual warfare is today!